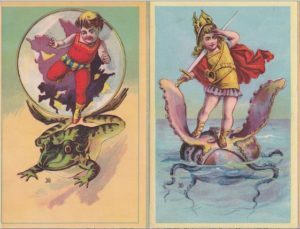 W W Denslow showed an impressive imagination early in life, as evidenced by these circa 1883 trade cards featuring children with strange creatures. 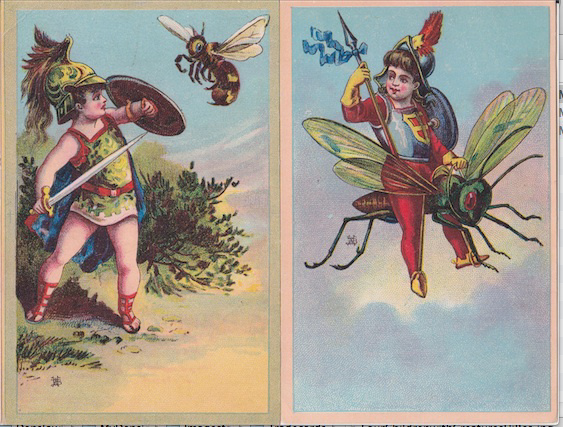 This fantasy set of four includes a boy bursting through a bubble landing on a frog, children riding a peculiar sea creature and a wasp, and a boy battling a giant bee. Two of these cards were known to be by Denslow as they were found in his personal scrapbook, and the other two were more recently discovered. All four advertising cards have been seen with the overlapping B&H mark of Baker & Hayes. Denslow is known to have worked for this Philadelphia firm, and this mark is used on other known Denslow cards, such as those with the child gods Pluto, Folly, Bacchus, Venus, and Minerva. These “strange creature” cards carry advertisements for various businesses on either the front or back. Discoveries like these are why I so love to collect Denslow. The adventure never ends. His art was diverse and prolific, so there’s always something new and interesting just around the corner. So keep an eye out for that elusive B&H mark! For more info, see pp. 48-50 of the Spring 2015 Baum Bugle. Click here to visit other interesting Denslow advertising items. You might also want to check out other interesting books and ephemera related to Wizard of Oz and Roycroft under New Listings. And don’t forget the ever-expanding Sale Items!